1 2 3 Phares, Heather (December 6, 2010). "Tron: Legacy - Daft Punk". Allmusic. Retrieved December 6, 2010. 1 2 "iTunes - Music - TRON: Legacy by Daft Punk". iTunes UK Apple. Retrieved March 12, 2012. ↑ Roberts, Randall (November 15, 2010). "KCRW and Disney to host preview of Daft Punk's 'Tron: Legacy' score on Saturday". Los Angeles Times. Retrieved November 20, 2010. 1 2 "'Tron Legacy' Panel Report, Fresh From San Diego Comic-Con". MTV. July 23, 2009. Retrieved July 29, 2009. 1 2 Tewksbury, Drew (December 16, 2010). "Daft Punk Pull Back the Curtain on 'Tron: Legacy' Soundtrack". The Hollywood Reporter. Prometheus Global Media. Retrieved April 30, 2012. ↑ Barry, Robert (October 13, 2010). "Suddenly The Maelstrom: Gaspar Noé On The Music Of Enter The Void". The Quietus. Retrieved June 16, 2013. ↑ Thorp, Debbie (November 23, 2010). "Daft Punk's Classical Meets Cyberpunk Approach to "Tron: Legacy"". CultureMob.com. Retrieved November 26, 2010. ↑ Bentley, Jason (November 29, 2010). "Tron: Legacy Soundtrack Preview". KCRW. Retrieved December 7, 2010. 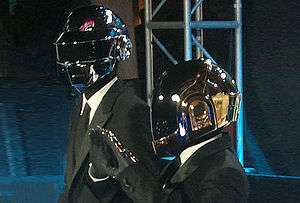 ↑ "Daft Punk's 'Legacy' act". Los Angeles Times. December 6, 2010. Retrieved December 9, 2010. 1 2 "Daft Punk tell all about Tron: Legacy". FactMag.com. November 18, 2010. Retrieved June 16, 2013. ↑ Perron, Erwan, and Gancel, Alice (April 7, 2013). "Daft Punk, interview-fleuve pour la sortie de Random Access Memories". Telerama (in French). PopMatters.com, Telerama.fr. Retrieved April 7, 2013. ↑ Dazed & Confused volume 2, issue 92 (December 2010). ↑ "Teaser trailer with "Derezzed" by Daft Punk". October 26, 2010. Retrieved October 26, 2010. ↑ "Trailer for "Derezzed" by Daft Punk". December 7, 2010. Retrieved December 7, 2010. ↑ Official website of Tron Legacy's soundtrack. Retrieved September 27, 2010. 1 2 "Tron Legacy: Special Edition [Soundtrack] - Daft Punk". Amazon.co.uk. Retrieved June 16, 2013. 1 2 "TRON: Legacy (Original Motion Picture Soundtrack) - Daft Punk". iTunes US Apple. Retrieved June 16, 2013. 1 2 "Tron: Legacy - Daft Punk". Amazon.co.uk. Retrieved June 16, 2013. 1 2 "TRON: Legacy (Nokia exclusive)". Nokia Music Store. Retrieved June 16, 2013. 1 2 "Tron: Legacy - Daft Punk". Metacritic. December 7, 2010. Retrieved June 17, 2013. 1 2 O'Neal, Sean (December 7, 2010). "Daft Punk: Tron: Legacy | Music | Music Review". The A.V. Club. Retrieved December 9, 2010. ↑ "Turn It Up: Album review: Daft Punk, 'Tron: Legacy' soundtrack". Chicago Tribune. December 6, 2010. Retrieved December 9, 2010. 1 2 Bennett, Matthew (December 8, 2010). "Daft Punk Tron: Legacy". Clash. Retrieved December 8, 2010. ↑ Mulligan, Jenny (December 3, 2010). "Daft Punk - Tron Legacy OST". Entertainment.ie. Retrieved June 16, 2013. ↑ Vozick-Levinson, Simon (December 1, 2010). "TRON: Legacy (2010) - Daft Punk". Entertainment Weekly. Retrieved December 9, 2010. ↑ Brown, August (December 6, 2010). "Album review: 'Tron: Legacy' score by Daft Punk". Los Angeles Times. Retrieved December 9, 2010. ↑ Martin, Dan (November 29, 2010). "Album Review: Daft Punk, 'Tron Legacy Soundtrack' (Virgin)". New Musical Express. Retrieved December 3, 2010. 1 2 Dombal, Ryan (December 10, 2010). "Tron: Legacy OST". Pitchfork Media. Retrieved December 11, 2010. ↑ Rosen, Jody (December 7, 2010). "Tron: Legacy". Rolling Stone, Jann Wenner. Retrieved December 9, 2010. ↑ Henderson, Eric (December 5, 2010). "Original Soundtrack: TRON: Legacy - Music Review". Slant Magazine. Retrieved December 9, 2010. 1 2 Walters, Barry (December 10, 2010). "Daft Punk, 'Tron: Legacy Original Motion Picture Soundtrack' (Disney)". SPIN. Retrieved June 16, 2013. ↑ Clemmensen, Christian (December 8, 2010). "Tron: Legacy soundtrack review". Filmtracks.com. Retrieved 8 January 2012. ↑ Caulfield, Keith. "Boyle's 'Gift' Keeps Giving on Billboard 200, 'Tron' Hits Top 10". Billboard. Retrieved 5 January 2011. ↑ "Daft Punk score first Top 10 album". Consequence of Sound. 1 2 Caulfield, Keith. "Taylor Swift Still Tops Billboard 200, Holiday Albums Tumble". Billboard. Retrieved 5 January 2011. ↑ Keith Caulfield. "Taylor Swift's 'Speak Now' Takes No. 1 in Record-Low Sales Week". Billboard. ↑ RIAA Gold and Platinum Search for Tron: Legacy RIAA Retrieved on December 22, 2011. ↑ Paul Grein (May 29, 2013). "Week Ending May 26, 2013. Albums: Daft Punk Gets Lucky". Chart Watch. Yahoo. Retrieved May 29, 2013. ↑ "2010 Austin Film Critics Association Awards". Austin Film Critics Association. Retrieved January 25, 2011. ↑ "IFMCA: the International Film Music Critics Association - 2010 IFMCA Awards". ↑ The Recording Academy. "2011 Grammy nominees and winners". Retrieved 2011-12-01. ↑ Tony Manfred (7 February 2014). "Sochi Olympics Opening Ceremony, Photos, Liveblog - Business Insider". Business Insider. ↑ "Daft Punk – TRON: Legacy (Original Motion Picture Soundtrack)". Discogs. Retrieved June 16, 2013. ↑ "Top 50 Albums Chart - Australian Record Industry Association". Ariacharts.com.au. Retrieved 2012-03-12. ↑ "Top 100 Albums In Canada". Jam! Canoe. Retrieved 6 January 2011. ↑ "Album Top 50 - Alle Musikvideos - Chart". MTV.de. Retrieved 2012-03-12. ↑ ""TRON: Legacy" erobert LP-Downloadcharts - media control" (in German). Media Control GfK International. 23 December 2010. Retrieved 22 December 2010. ↑ "Soundtrack and Daft Punk - Tron: Legacy - Music Charts". Acharts.us. Retrieved 2012-03-12. ↑ "FIMI - Federazione Industria Musicale Italiana - Classifiche". Fimi.it. Retrieved 2012-03-12. ↑ "Mexico Top 100" (PDF). AMPROFON. Retrieved 21 January 2011. ↑ "chatrs.org.nz - Soundtrack / Daft Punk - Tron Legacy". Hung Medien. 2013-12-20. Retrieved 2013-12-20. ↑ "Archive Chart". UK Dance Albums. The Official Charts Company. Retrieved 18 December 2010. ↑ "Top 100 Music Hits, Top 100 Music Charts, Top 100 Songs & The Hot 100". Billboard.com. 2010-12-25. Retrieved 2012-03-12. ↑ "ARIA Charts – Accreditations – 2010 Albums". Australian Recording Industry Association. ↑ "French album certifications – Daft Punk – Tron Legacy" (in French). Syndicat National de l'Édition Phonographique. ↑ Stylized Tron: Legacy R3CONF1GUR3D on the front cover, but referred to as Reconfigured on the album spine and liner notes.